In conidial fungi or molds, dry conidia are often released by passive mechanisms or by disturbance such as gravitation force, convection currents, deflation force, or mechanical disturbance. Some spores are actively released by osmotic force built up with water. Movement and feeding of arthropods, such as insects and mites, are also a common release-dispersal mechanism.97-99 Drifting mist or tiny water droplets in air current can serve as a secondary process to carry and disperse spores of Cladosporium91 and C. herbarum.100 Dry-spored fungi include such common indoor fungi as species of Alternatia, Aspergillus, Cladosporium, and Penicillium. Wet-spored or slimy-spored fungi include species of Acremonium, Aureoba-sidium, Fusarium, Phoma, Stachybotrys, and Trichoderma, to name only a few. Active discharge mechanisms by osmotic force are not uncommon in fungi, but rare in molds or hyphomycetes. Epicoccum nigrum and Arthrinium cuspidatum are discharged when sudden rounding of the basal cell under the spore occurs.97 Pressure buildup from water absorption is involved in spore discharge in many species of ascomycetes and basidiomycetes.100 The well-known "cannonball" fungus, Sphaerobolus stellatus, absorbs moisture to build up pressure in the inner wall of the sporophore. The pressure and strain cause the inner wall to turn inside out and catapult the spore mass covered in a sporing tissue (the entire structure is called gleba) for a distance of several meters. The cannonball fungus is a basidiomy-cete and common on very rotten wood, dung of herbaceous animals, or mulch.100 The black dots on exterior walls of houses and buildings are occasionally reported when rainfall occurs after new mulch is applied. The gleba is covered with a sticky liquid, which becomes tightly bound to the wall after drying. Ascomycetes may actively discharge their ascospores by internal pressure of asci. 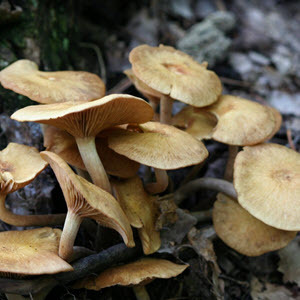 Some ascomycetes, however, may dissolve their asci and release ascospores in wet masses for insect pickup and dispersal. Chaetomium species are wet-spore producers. Their ascospores are released in wet mass after their asci are dissolved.86 Wind or air movement plays an important role in spore dispersal of most spore types and basidiospores. Air movement carries and disperses basidiospores after they are ejected from basidia and fall out from between the gills of the basidioma.47 Basidiospores of Coprinus species can be carried away and dispersed by insects, which are attracted by odors produced by the mushroom and pick up slimy spore masses by contact. Although wet, slimy spore masses are likely to be picked up and dispersed by insects, they may become dry and airborne.